Oh, you’re still here, huh? My karate instructor, I assure you, was every bit as good at karate as he was telling jokes. Ahem. The joke, it turns out, is a very old joke, which you can see for yourself. That joke has even made it into an academic journal: The Journal of the Folklore Institute. I manure you not. 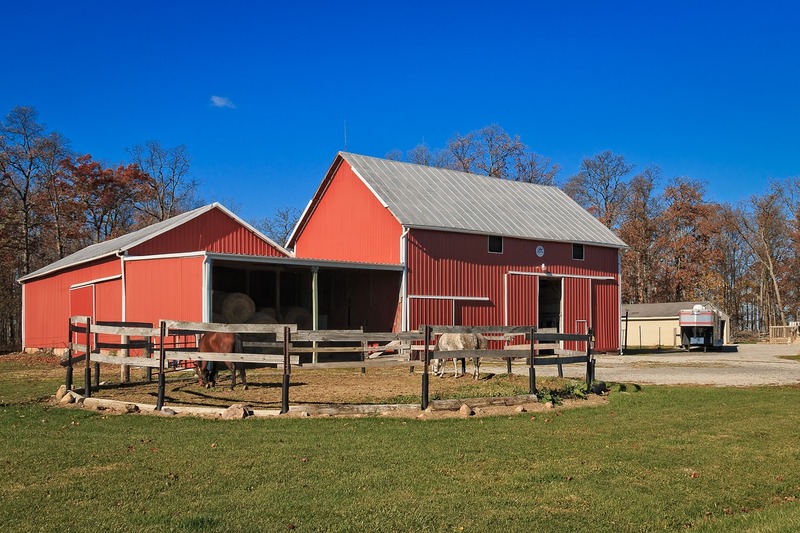 I myself was in the middle of farm country, in the middle of Ohio, in the middle of a November 2016 excursion out into the countryside north of Columbus. I opened the first blog segment of this journey with a photo of an elaborate Trump sign, so I suppose it is only fitting that I do the same here. 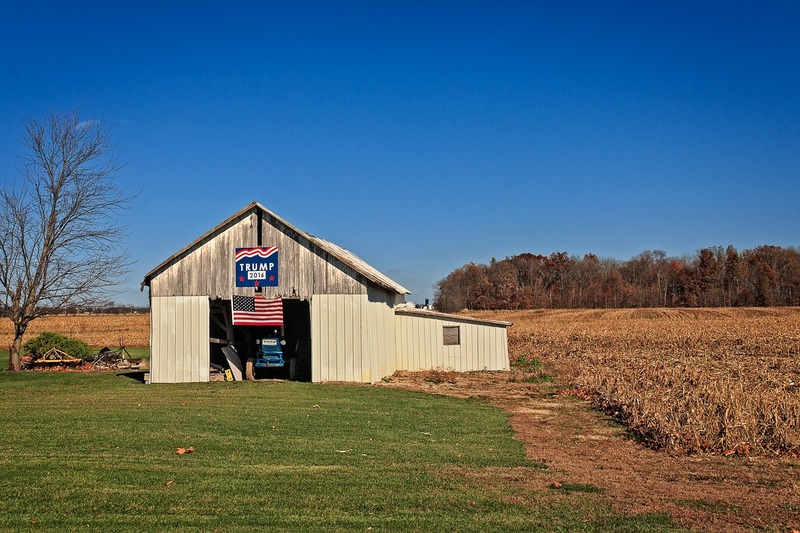 Trump signs were thin on the ground where I live, in the liberal bastion of Columbus, but they certainly filled rural Ohio last November. I came across this impressive old house, well-maintained, in the tiny hamlet of Waldo, Ohio (population 388, salute!). If you were ever wondering to yourself, where’s Waldo, well, as Andy Griffith might say, it’s right cheer. Waldo, Ohio, was named by its surveyor, Milo Pettibone, after his son, Waldo Pettibone. You’ve got to figure it was someone named Milo who named someone Waldo. Milo didn’t have a lot of luck with his sons. Three of the four died young: one committed suicide and two, including Waldo, were killed during the Civil War. 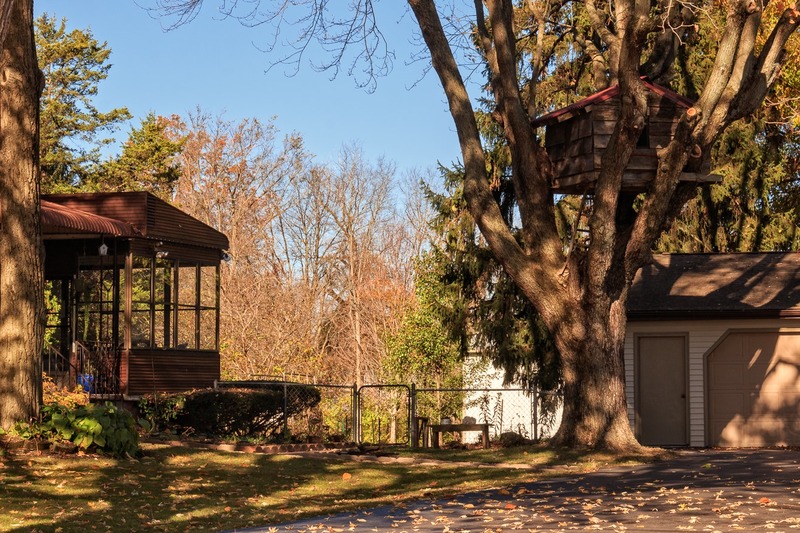 As impressive as the house was, I found the tree and treehouse in the yard just as impressive. It took some doing to put that sucker together. Waldo, as it is so tiny, has few businesses. Until relatively recently, one of those businesses was Groll’s Furniture, as can be seen from its nifty sign. Groll’s lasted well over a hundred years as a furniture business, drawing on people from the countryside, but closed its doors in 2008. 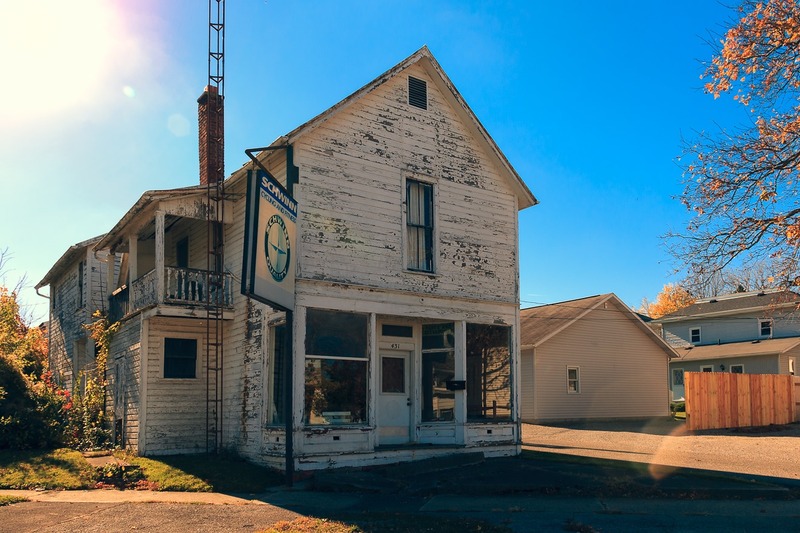 When a business like that closes in a small village, usually nothing replaces it and the building stands empty. 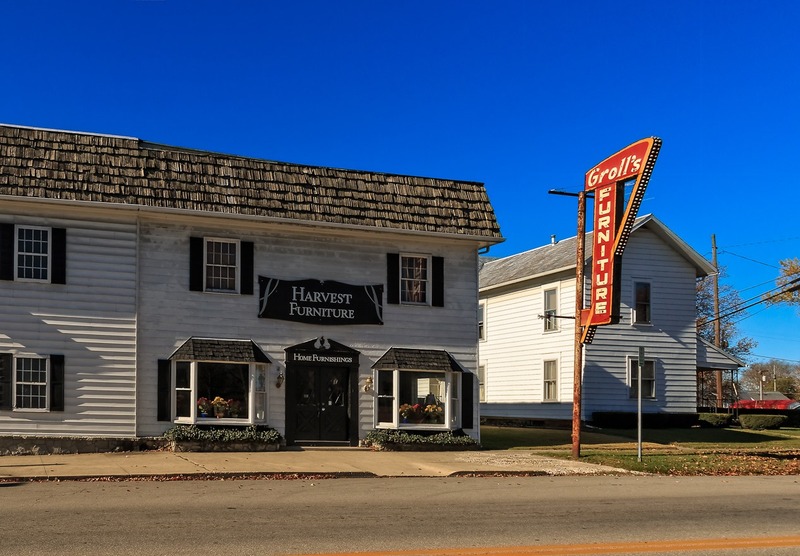 However, in this case, in 2011 a new business moved in and, oddly enough, it was another furniture business, Harvest Furniture. I am not quite sure why they didn’t bother to remove the old sign. 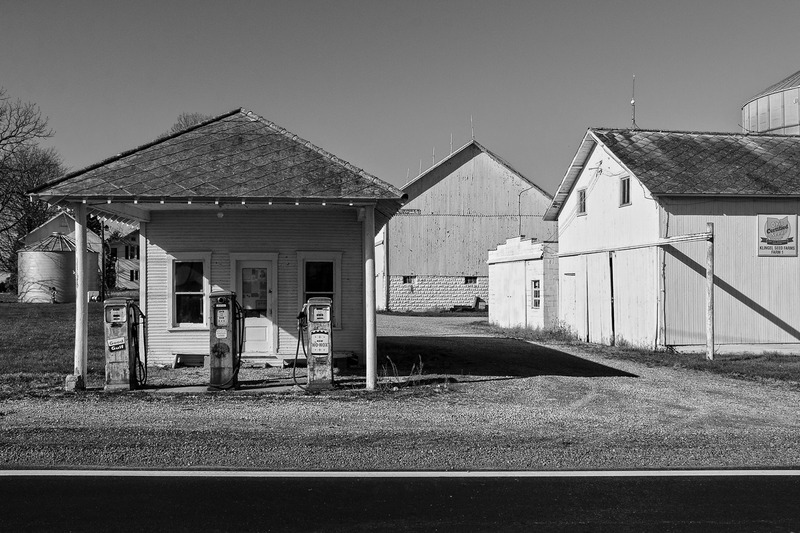 A few miles north of Waldo, I came across a real blast from the past—an ancient gas station, still with its pumps. While I find old gas stations on a regular basis, I rarely ever find any with pumps later than the 1970s or so—and these well pre-date that. 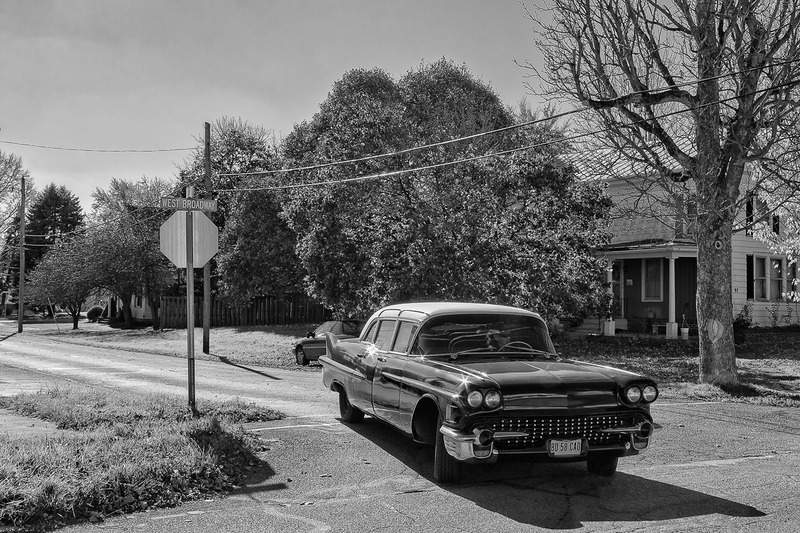 It made me want to give the place the black-and-white treatment, to help me transport myself back in time. By now I was a bit northeast of Marion, Ohio, which is how I ended up in the tiny village of Caledonia (population 577, salute!). Caledonia doesn’t have many claims to fame, but Warren G. Harding did briefly live here. Today, Caledonia hosts the oddly-named Camouflage Café. If you want to go, you’d better get there early, because they close at 3pm. They seem to love ham & bean soup. I could not find any explanation for the name. It doesn’t take but an eyeblink to be out in the countryside again and it was thus that I found this fairly rare example of a circular corral. This may fall into the category of “things that interest only me,” but just remember you were not charged admission to this blog! 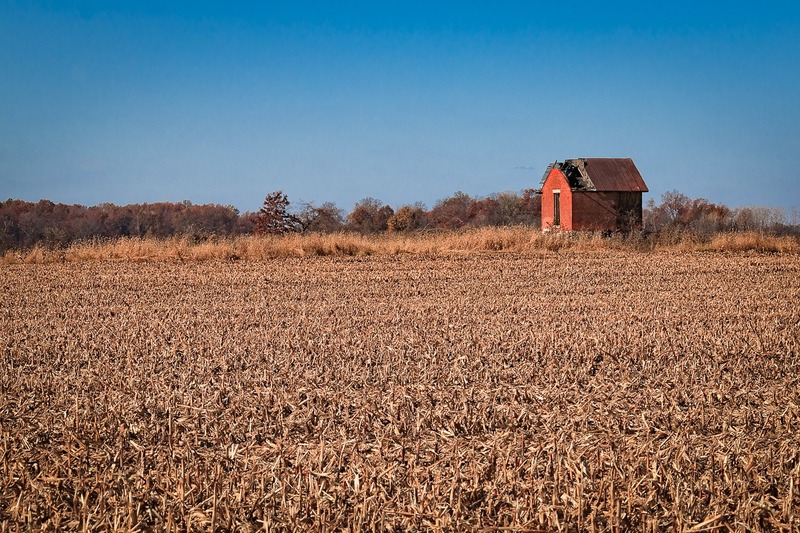 Way out in an empty autumn cornfield, I did see a mysterious little building with no easily determined purpose. It was made of brick, rather than wood, so it was not likely to be a farm outbuilding, but it was too small even for a one-room schoolhouse. The window makes it unlikely to be some sort of toolshed. Here’s a wider shot to give you more of an idea of how small and out in the open this little building was. Finally, my travels took me to the north central Ohio town of Bucyrus (population 12,362, salute!). 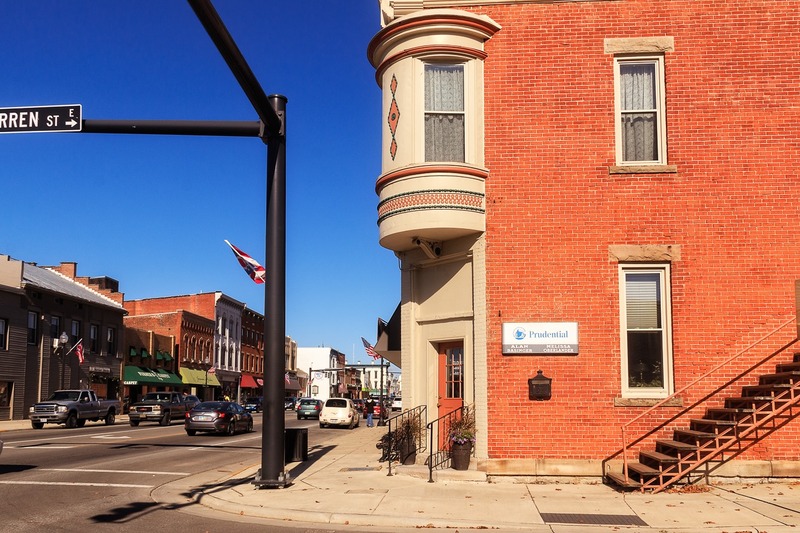 Technically, Bucyrus is a city, even though no one would consider a municipality of such small size to be a “city.” But in the U.S. there is no formal definition of city, town, village, hamlet, and the like. 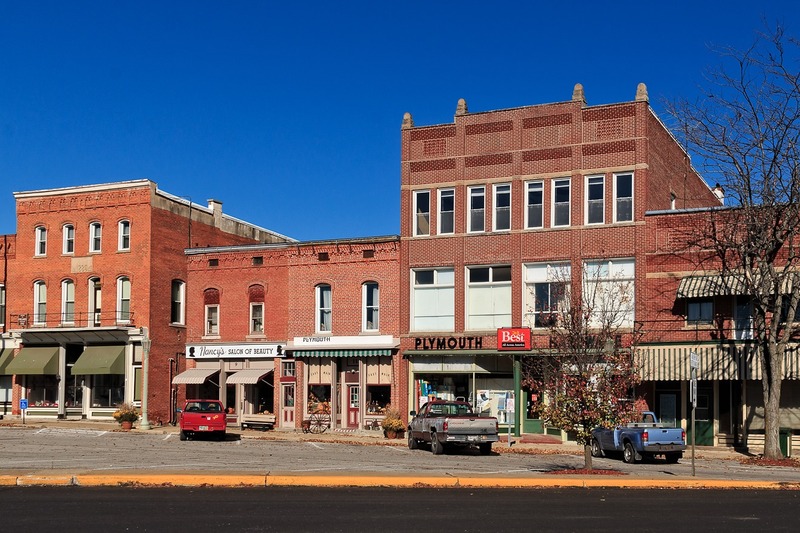 Each state defines incorporated municipalities their own way—and usually those laws were written in the 19th century (or even earlier), when populated places were much less, well, populated. Ohio, for example, recognizes only “cities” and “villages.” “Towns” do not exist. And to be a “city” in Ohio, a place need have only 5,000 residents. A village needs only 1,500 (although this was a later addition, with the result that many smaller, older villages were “grandfathered” in). Other communities are simply unincorporated—officially, they do not exist and cannot have a system of government. I don’t really pay attention to that when I write, which is why you see me refer to (in descending order) cities, towns, villages, and hamlets. You may also hear me refer, from time to time, to unincorporated areas (which I will usually consider hamlets) and census-designated places, which tend to be very tiny settlements, or former settlements, but this is an official U.S. census term that often seems reserved for locations that do, or ever once did, have a post office located there, even if it had virtually nothing else. Here we see what was once probably a small neighborhood store (with the residence on the second floor (my grandmother used to own such a place in Pennsylvania), but more recently was repurposed to sell bicycles—with apparently insufficient success. Bucyrus is a nice little town. It was once one of many thriving industrial towns and a fair amount of industry survives in the area even today. It’s population has been slipping a bit in recent decades, though, which is not a good sign. It has typical small town architecture, including this nice building cupola. I tarried not long in Bucyrus and soon was out in the countryside. 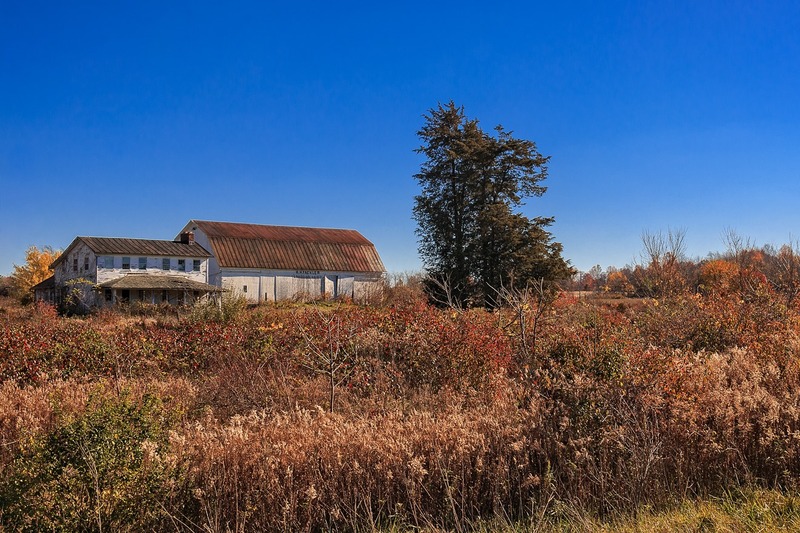 Near Plymouth, Ohio, I found this large abandoned farmhouse and large abandoned barn. You’ll notice the name “H. H. Fackler” is painted on the side of the barn. This little fact led me on a long quest for information, which I eventually found, with some effort. 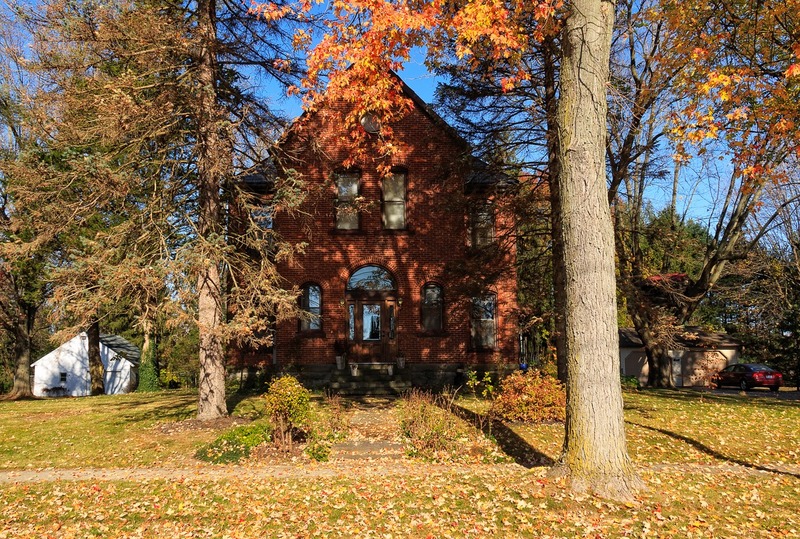 This property once belonged to Henry H. Fackler (1895-1954), a farmer who headed the Ohio Marketing Quota Protest Association in the 1940s. During and after World War II, Fackler led protests against federal agencies such as the Office of Price Administration and the Agricultural Adjustment Administration over price controls, quotas, gasoline restrictions and other wartime measures he and his fellow farmers deemed harmful. After the war, when price controls had not yet been lifted, Fackler led “strikes” in which farmers refused to sell livestock and farm products at market, in an attempt to get controls lifted. Fackler was an ally of North Dakota Congressman William Lemke, a progressive Republican who originally supported FDR but like Huey Long, had a falling out with the president. In 1936, after Long’s assassination, Lemke ran for president on a third party ticket as part of an alliance with right-wing extremists Gerald L. K. Smith and Father Charles Coughlin. Lemke was a prominent supporter of farmers’ causes; thus his alliance with Fackler. Plymouth, Ohio (population 1,857, salute!) is a village at the southern edge of Huron County (which is one county but one south of Lake Erie). 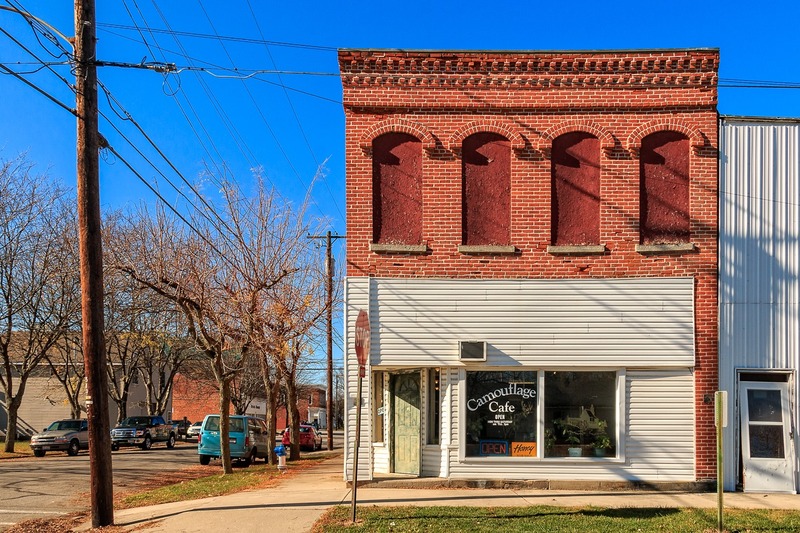 It’s got a typical Ohio village look, with commercial buildings that may have businesses on the ground floor (like Nancy’s House of Beauty) but appear to be mostly vacant upstairs. Behind such buildings one can see the face they do not present to the world, including this interesting covered staircase. 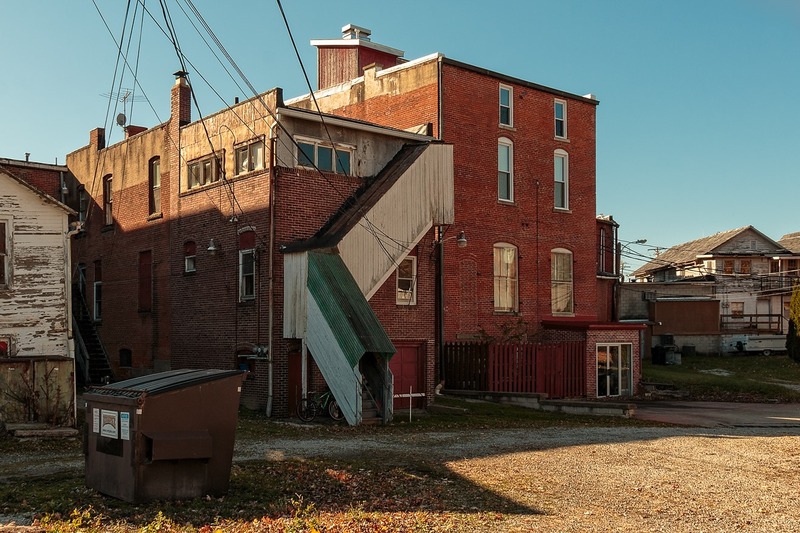 Such covered exterior staircases seem to have once been very common in Ohio, both for commercial buildings as well as the occasional residential building. Even when they themselves have not survived, you often see evidence on building walls where they once existed. I have never traversed such a staircase—this one does seem rather gloomy and even claustrophobic. But I worked for 19 years in a building with a naked exterior staircase exposed to the elements, which I had to use every day, so I can appreciate the “covered” part of it, especially on rainy and snowy days. In Plymouth, I easily spotted the remains of what was once the village’s train station. I say easily, because I have seen dozens of nearly identical train stations across Ohio, all clearly built on a pattern. I would have thought, before I started my excursions, that every train station would be different, reflecting the character of each town, but I’d have been wrong. Most were cookie-cutter things, perhaps hurriedly erected by the railroads. As I was beginning to leave Plymouth—and this is as good a stopping point as any for this entry; the final third of my excursion will appear separately—I unexpectedly came across a sparkly and pristine classic automobile out for a drive. Identifying the make and model of the vehicle turned out to be rather easy, insofar as it is described on the license plates! This is a 1958 Cadillac, with all of the fins and chrome that the term implies. You could really load one of these Cadillacs with accessories, including an automatic heating system, a “six-way seat adjuster,” power windows, fog lamps, a remote control trunk lock, air conditioning, and even electric door locks (which I never had in a vehicle until 2004!). Moreover, if some sneaky salesman tried to sell you the undercoating, well, it was just five bucks. Sweet. When my wife and I go traveling about the state, we enjoy discovering little reminders of the past in out-of-the-way places. One of those places we stumbled upon the other day was an old-fashioned gas station along Rt. 98 north of Waldo, in Marion County. 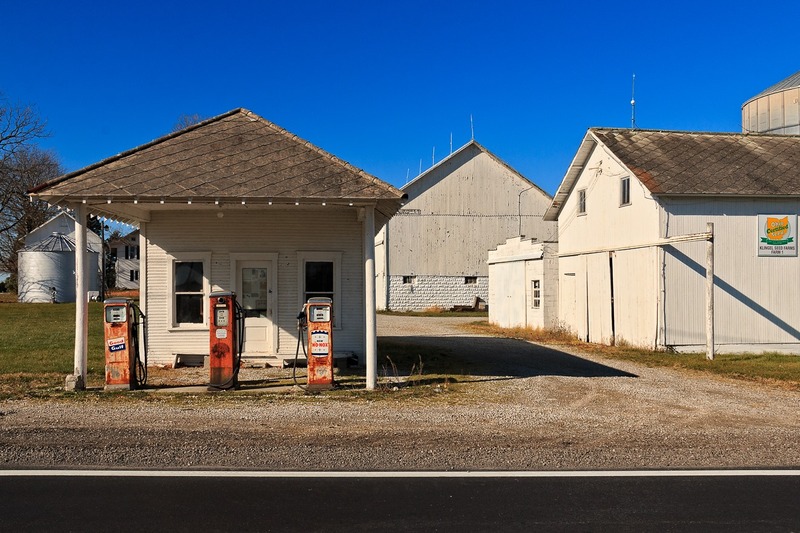 I’ve seen old-fashioned gas stations before but rarely with the old pumps still out front. Considering the skyrocketing gasoline prices these days, I wondered what gas from those old pumps cost. I decided to do a little investigating. I located Candy Makowski, whose family operated the gas station from 1926 to 1963. 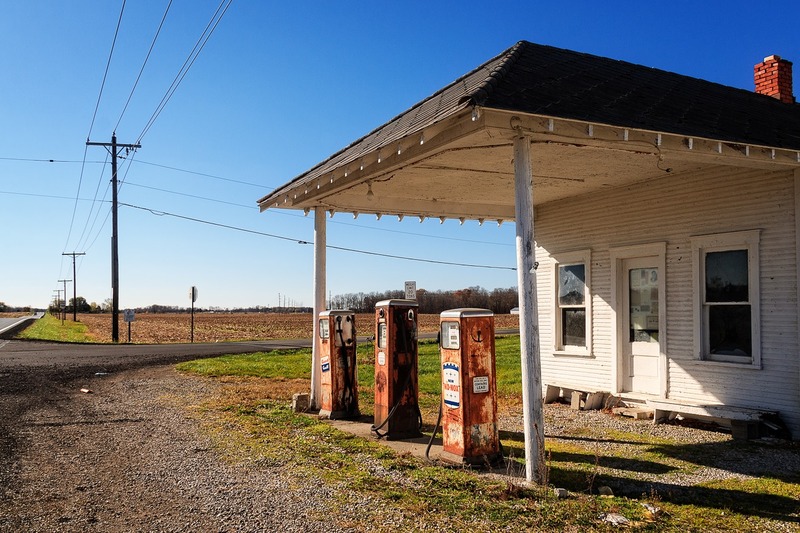 She checked family records and found that, even back in the early years, gas prices fluctuated as they do now; but back then, it was only a penny or two or three at a time and not a dime to a quarter as we experience now. In 1926, gas was selling for 22 cents a gallon. Then in 1927, it dropped to 19 cents a gallon. Some of the records from 1927 show that gas prices got as low as 17 cents a gallon. 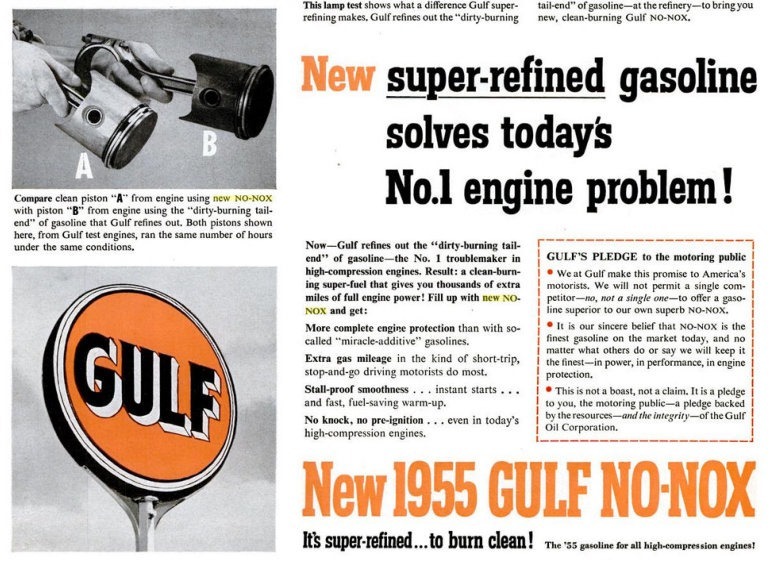 In 1926, two quarts of oil sold for 60 cents, and 5 gallons of kerosene sold for 85 cents. Makowski’s grandfather began operating the gas station in 1926, and other members of the family carried on after that. 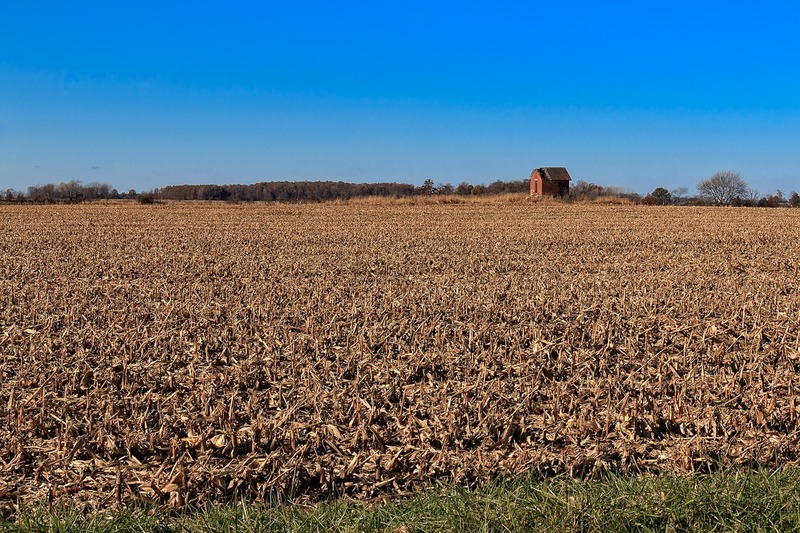 “My dad’s great-great-grandfather purchased the land in 1835,” she said. The family farmed the land around the station. Back in the early days, Rt. 98 was called Mud Pike. Makowski found gas-rationing stamps used during World War II as she was going through the old records. “It was a busy place,” she said. Many people stopped there because gambling and bootleg whiskey were available in an adjacent shed. Not all bootlegging during Prohibition went on in big cities. Some country folks relished a touch of spirits now and then. The whiskey was made in nearby woods. That’s a snippet of history that will eventually fade away, but it shows how things once were, and I think that’s interesting. 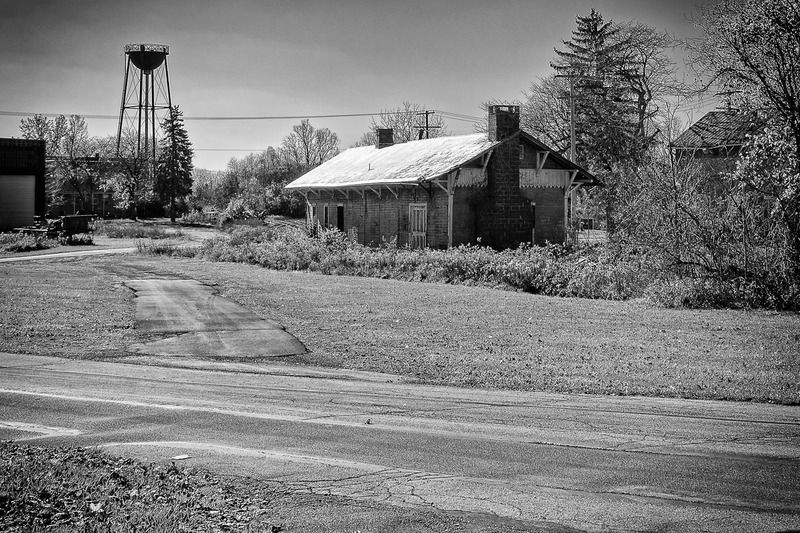 Another place I found on that same jaunt was the wonderfully preserved Reedtown one-room, brick schoolhouse along Rt. 4 in Seneca County. It even has its bell tower and bell, and you don’t see that often.